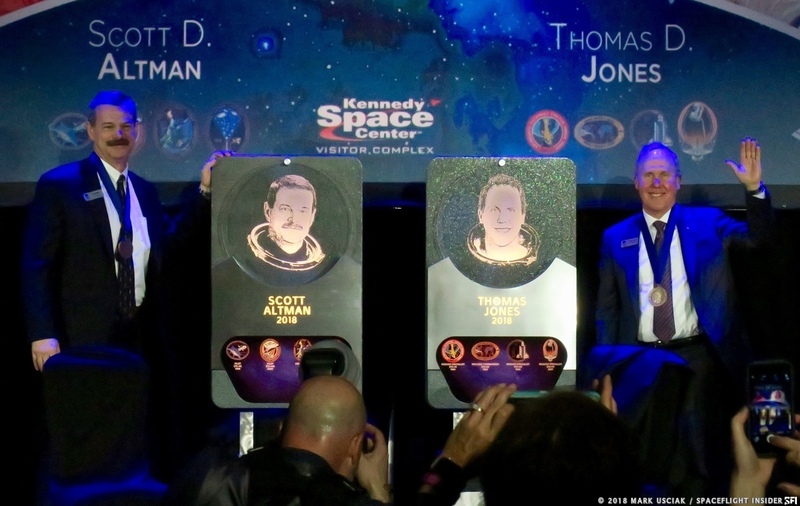 KENNEDY SPACE CENTER, Fla. — On April 21, 2018, the U.S. Astronaut Hall of Fame membership swelled to a total of 97 when Space Shuttle astronauts Thomas Jones and Scott Altman were inducted into the hall. This was the 17th induction of astronauts from the Space Shuttle era. In a ceremony appropriately set beneath the Space Shuttle Atlantis at the Kennedy Space Center Visitors Complex, the two men were honored for their accomplishments while at NASA. More than 15 other members of the hall were in attendance including Apollo 7’s Lunar Module Pilot Walt Cunningham, STS-1 Pilot Robert Crippen, and other Space Shuttle veterans such as Story Musgrave, Ellen Ochoa, Jerry Ross, and Charlie Bolden. Each year, inductees are selected by a committee of astronauts already in the Hall of Fame, along with former NASA officials, flight directors, historians and journalists. To be eligible, an astronaut must have made his or her first flight at least 17 years before the induction. Candidates must be a U.S. citizen and a NASA-trained commander, pilot or mission specialist who has orbited Earth at least once. Jones started his career in the U.S. Air Force having attended the Air Force Academy prior to piloting B-52 bombers. During the induction ceremony, he told a humorous story during about his academy days when he met two Apollo-era legends. Jones did finally get accepted into NASA’s astronaut corps and started his career with the agency in 1990. His first Space Shuttle flight came in April 1994 when he spent 11 days in orbit for the STS-59 mission on board Endeavour. His primary responsibility was to run the science operations on the “night shift” during the first flight of the Space Radar Laboratory (SRL-1). With the SRL-2 flight scheduled just six months later, he returned to space for another 11-day mission in October of 1994, once again on board the Endeavour, where he served as the payload commander. It was just over two years before he flew again when he launched on Nov. 19, 1996, aboard the Columbia for mission STS-80. Jones used the orbiter’s robotic arm to release the Wake Shield Facility and later re-capture it from orbit. Two six-hour space walks had been planned for the mission, however Jones and his spacewalking partner, Tamara Jernigan, never got outside the orbiter as the crew could not open outer airlock hatch. The mission also set a Shuttle endurance record with the mission lasting 17 day, 15 hours, 53 minutes and 18 seconds. For his final flight, Jones flew aboard Space Shuttle Atlantis on the STS-98 mission in February of 2001. The almost-13-day mission to the International Space Station had a primary goal to deliver and install the U.S. Destiny laboratory module to the orbiting outpost. During the construction flight, Jones did finally get outside the spacecraft to perform three spacewalks to help install the module. Combined, his three outings inside a spacesuit lasted just under 20 hours. After NASA, Jones authored four space and aviation books and engineered intelligence-gathering systems for the CIA. 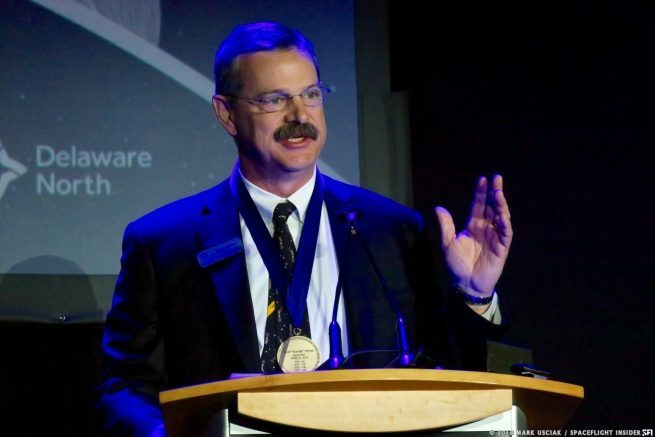 He is currently a senior research scientist at the Florida Institute for Human and Machine Cognition, focusing on the future direction of human space exploration, uses of asteroid and space resources, and planetary defense. Altman served in the United States Navy before joining NASA. He was commissioned as an ensign in 1981 and earned his pilots wings 14 months later. He has flown multiple types of aircraft including the F-14A and F-14D Tomcats. He has logged over 7000 flight hours in over 40 types of aircraft. While his NAVY and NASA careers are among the most visible points of his life, he has probably been seen more by more people, albeit unknowingly, in the 1986 movie “Top Gun” where he flew aerial acrobatic flights. Altman’s first Shuttle flight was aboard the Columbia where he served as the pilot for STS-90. The mission flew the Neurolab science experiment laboratory in it’s cargo bay with experiments that studied the human the nervous system. The flight launched on April 17, 1998, and lasted for more than 15 days. His second and final flight as Shuttle pilot came in September of 2000 when the crew of the Space Shuttle Atlantis flew to the fledgling International Space Station and prepared it for the first permanent crew. His two flights as commander of the Shuttle were the STS-109 mission, once again aboard Columbia, and STS-125 mission, once again aboard Atlantis. Both were missions to retrieve and service the Hubble Space Telescope to allow it to continue functioning as NASA’s eye into the cosmos. These servicing missions were some of the most high-profile and high-risk missions that the Space Shuttle program ever performed, and both missions accomplished all their goals. Altman’s career in space totaled more than 51 days over his four missions. He is a recipient of the Distinguished Flying Cross, the Navy Commendation Medal, and was the 1987 award winner for outstanding achievement in Tactical Aviation as selected by the Association of Naval Aviation. 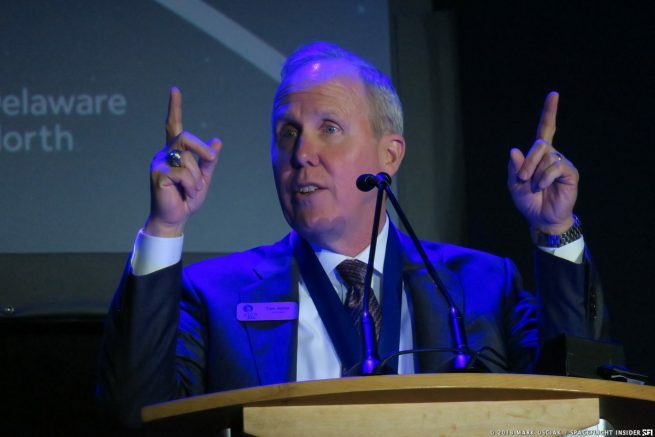 He retired from NASA in 2010 to join the ASRC Federal family of companies.